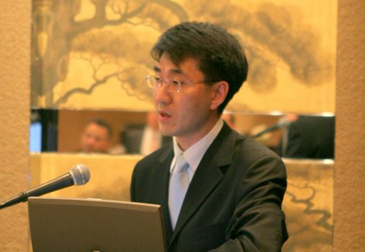 Mr. Lee Ji-Soo speaks at ANZCCK Breakfast Forum on March 14. The topic of discussion at the latest Australia New Zealand Chamber of Commerce (ANZCCK) Breakfast Forum, held on Tuesday morning March 14, 2006, began with the quality of the toast being served at the Form and moved on to the fight for a more transparent corporate Korea. Held at the Grand Hyatt Hotel at 8:00 a.m., the Breakfast Forum was opened by the new Chairman of the ANZCCK Glen Feist who then introduced the guest speaker Mr. Lee Ji-Soo to the various New Zealand and Australian businessmen in attendance. Dignitaries from the New Zealand and Australian embassies also attended the Breakfast Forum that is held regularly throughout the year. Tuesday's guest speaker Mr. Lee is a foreign legal consultant at The Centre for Good Corporate Governance (CGCG) in Korea, a think-tank affiliated with the shareholder-rights movement People's Solidarity for Participatory Democracy (PSPD) founded in 1994 as an organsiation aiming to safegurad Korean people's rights. The CGCG was established in 2001 by members of the PSPD as a "research institute specializing exclusively in the area of corporate governance that is independent from the government and the corporate sector," according to its mission statement, and as a corporate watchdog the CGCG currently monitors 75 Korean companies for breaches of shareholder rights. 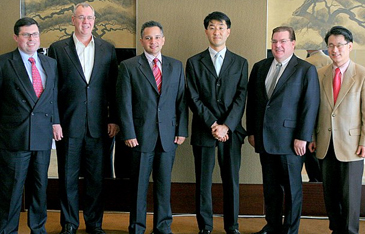 Chairman of the ANZCCK Glen Feist (second from right) poses with other ANZCCK members at Grand Hyatt Hotel in Seoul. Samsung, Korea First Bank and SK Telecom, are just a few of the major corporations that have been targeted by the CGCG for their infringements. In fact, the Korea First Bank was the target in the PSPD's debut court case in 1997 in which KEB was accused of breaking due process and forcing resolutions without consulting shareholders. The PSPD won the landmark case. Despite such successes the PSDP and the CGCG still don't rate Korea very highly in terms of corporate governance, giving Korea a five or six on a scale of one to ten. As an organisation that relies mainly on publishing reports, consulting for investors and making policy analyses for various clients the CGCG can only do so much. With government and funding and involvement though the organisation would be able to implement far-reaching policies that would change the Korean corporate sector for the good and increase shareholder confidence no end. Although as a breakfast discussion it may have been a lot to digest, the ANZCCK businessmen gathered in the Namsan room of the Hyatt appeared to consider a very pertinent presentation and a reminder perhaps of the changing face of Korean business.